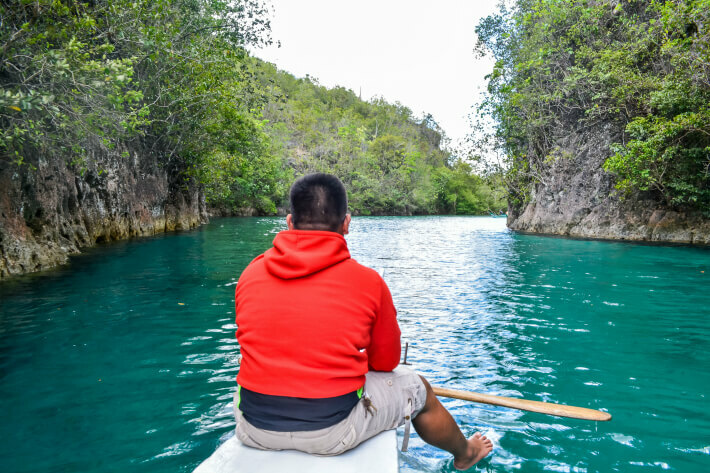 From its towering limestone cliffs to its tasty local delicacies, the Bojo River tour in Aloguinsan has all the hallmarks of fantastic weekend getaway in Cebu. 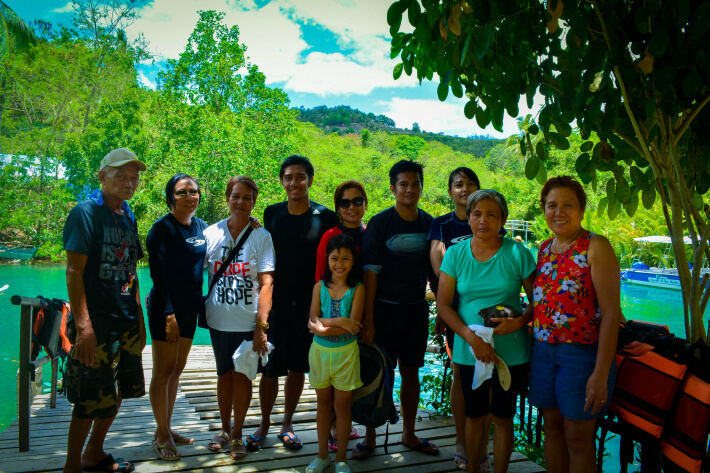 Just recently, me and a bunch of my favorite peeps went to Aloguinsan to explore a river that has been perpetually pitched to us by a family friend. And, I’m truly glad she introduced it to us since everyone had a blast during our recent trip to this part of Cebu. Our trip in Aloguinsan started on a high note, thanks to the delicious snacks offered by the Farmhouse. 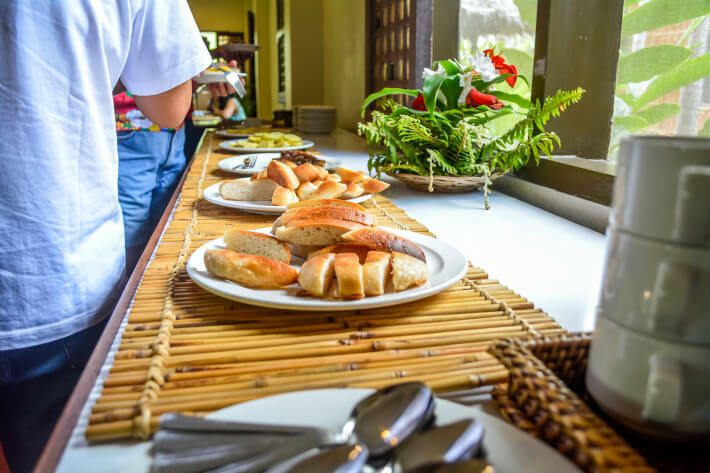 As part of our tour package, we were served with a variety of tasty local treats, such as sikwate, biko, and my personal favorite – pan bisaya. In addition to the mouthful goodies, the place where we ate our snacks has a classy old-world feel. There’s a harp and a set of antique furniture here, which can conjure up images of Spanish colonial houses. After we nibbled our snacks, one of the guides in The Farmhouse took us to a short tour around the area. Personally, I think the quick tour was great and informative, and can be an inspiration for those who want to dive into organic farming. As a matter of fact, I’ve learned a couple of things that could help my hog-raising business flourish. From The Farmhouse, we took a short drive to the famed Bojo River of Aloguinsan. Upon our arrival, a quartet of accommodating locals welcomed us warmly with lovely necklaces made of flowers. One of them, then, led us inside and into their welcoming area. Along the way, I got a sneak peek of what’s to come as well as the majesty of the Bojo River. Afterwards, we were greeted wonderfully with a serenade from a group of talented townsfolks. Before we could hop aboard our boat, our tour guide asked us to step inside their nipa cottage, for some instructions regarding the cruise. As we were listening to our friendly, we were treated to a fresh serving of buko juice. 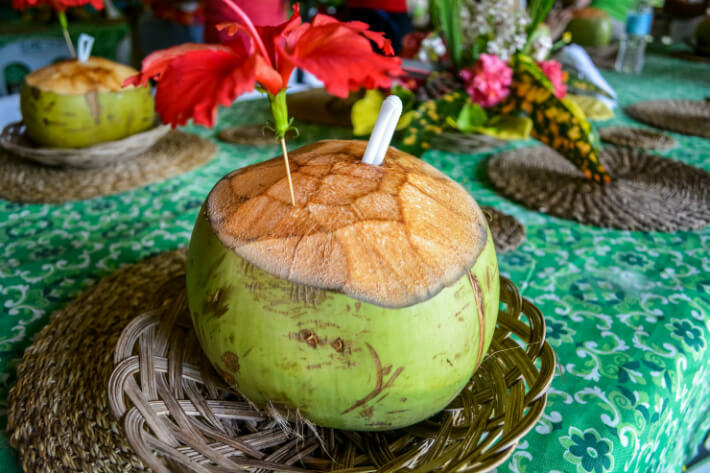 It was, of course, refreshing, and it also gave me an extra boost energy for the cruise (coconut juice by the way is a natural energy drink). There was also a palina before the tour started, which is a ritual or a traditional practice with pre-Hispanic roots that is still performed today to ensure a safe voyage and ward off evil spirits. A few minutes later, we departed from the wooden jetty, to commence our Bojo River cruise. Our guide introduced herself to us, and shared some history of their cause and association. While I wasn’t a keen listener (I just couldn’t resist the urge to snap photos), I was still able to pick up a few lessons about the river’s flora. For instance, I discovered how important the decaying mangrove leaves are in the river’s eco-system. Plus, I’ve learned that the Bojo River is home to over 70 species of birds. As we got closer to the river mouth, a familiar sight caught my eyes – the limestone rocks that serve as a gateway to the sea. 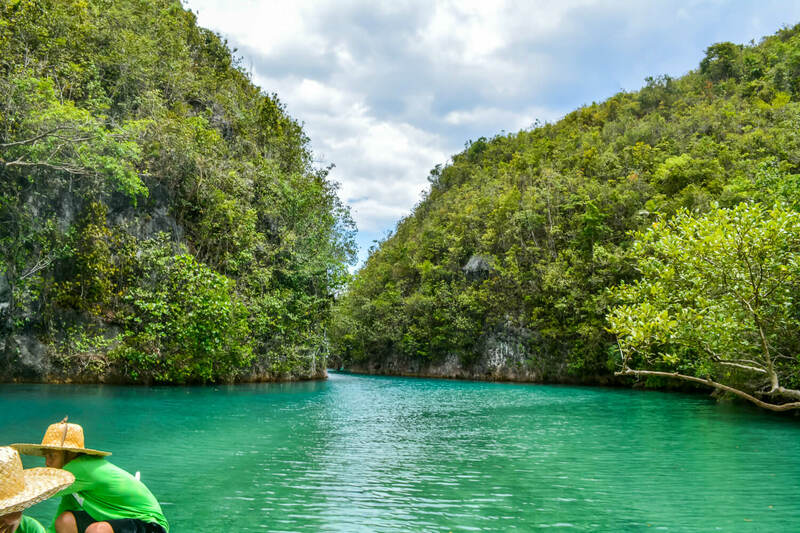 If you have been to Coron, the steep limestone rocks in the river’s mouth would definitely remind you of your trip to this beloved destination in the Philippines. Draped beautifully in greenery, these cliffs are truly a sight to behold. Once our boat was outside the steep rock gateways of the river, the clear and clean turquoise waters, all of a sudden, shifted into deep blue. 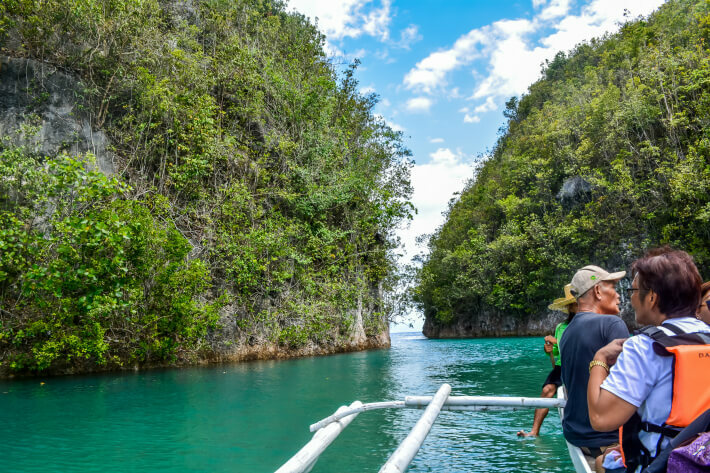 We were told that we’re already in Tañon Strait – the 161-kilometer strait that lies between the islands of Cebu and Negros. 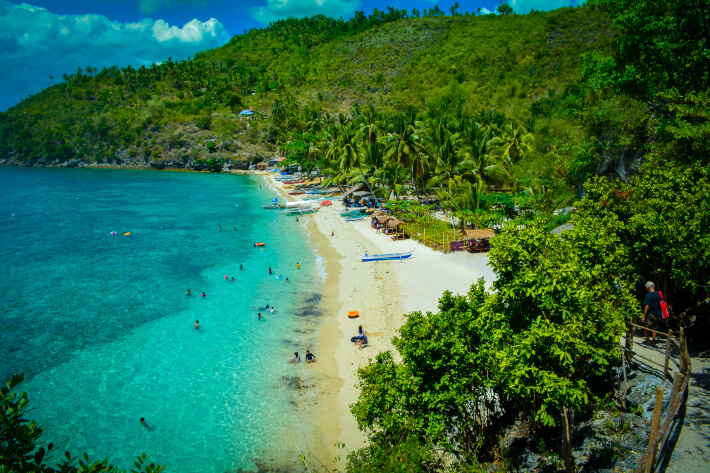 Here, you can snorkel and admire its gorgeous marine creatures and corals, which you can see above without diving. Unfortunately for us, though, we forgot to bring our snorkeling gear. Nevertheless, we had a great time swimming near the river’s mouth, even without goggles. 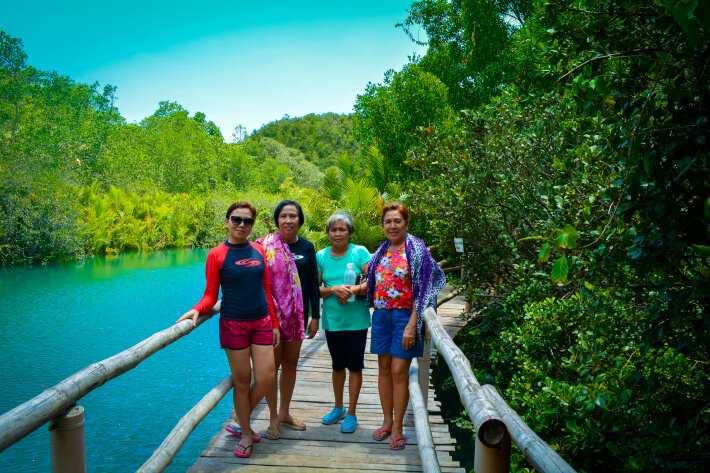 With its lush surrounding vegetation, cool brackish waters and the shade given the steep rocks, our swimming adventure in Bojo was remarkably cool and refreshing. We spent more than 20 minutes there, just swimming around, and admiring its spectacular sights. As much enjoyable and fun it was, we had to return to the jetty to round up our eco tour in Bojo. As the saying goes, all good things come to an end. 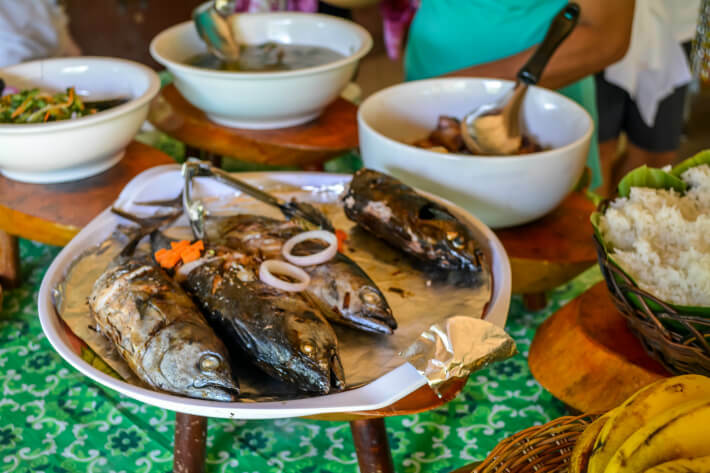 While we’re heading back to our cottage through the bangka, my stomach started to grumble, and it was longing for a hearty and tasty Filipino dish. Thankfully, the next stop on our Bojo River tour was a lunch buffet at their cottage. The lunch provided the folks in the river were actually a part of our tour package. As I’ve expected, our taste buds and gastronomic urges were treated to a variety of Filipino dishes, including utan bisaya with chicken, humba, and sinugbang isda. We were also served with fresh camote juice sweetened with calamansi. From the presentation to the flavors, the meal was very much Cebuano I must say. It’s not the best buffet in Cebu, but it was pretty tasty and filling. After eating our lunch, we took a walk at the bamboo bridge, along the river, to snap photos and enjoy some of the sights we didn’t see on the cruise. The bridge was a little long, and gave us a ton of fascinating views of the river from different angles. I thought the tour was over, and I was already preparing my stuff for our next adventure. Surprisingly, a couple of friendly women came to our table, to demonstrate the art of pandan weaving. Armed with beautiful smiles, these two folks taught us how to make the puso (the famous hanging rice of Cebu) and banig (a traditional hand-woven mat used for sleeping). 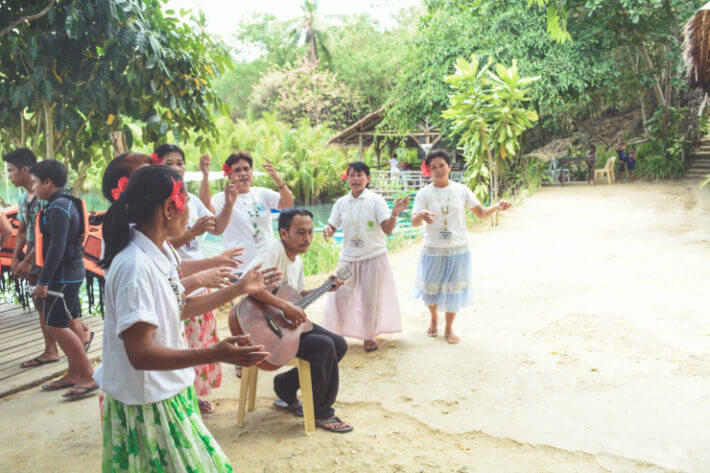 The tour culminated also on a positive fashion, with the staff singing Cebuano folk songs, and thanking us for visiting their place. Honestly, the river’s staff was one of the most accommodating groups of people I’ve ever met. They are totally friendly, and they would do anything to make your visit worthwhile. Well, our trip didn’t end there. After our wonderful Bojo River eco-tour, we went to Hermit’s Cove to appease our craving for salt water and pristine sands. I will probably release a separate travel guide to Hermit’s Cove in the near future. We traveled there through a private van owned by my lovely cousin, so I can’t give you my personal experiences, as far as public transportation to Aloguinsan is concerned. But trust me, there are plenty of other ways to get to Aloguinsan. 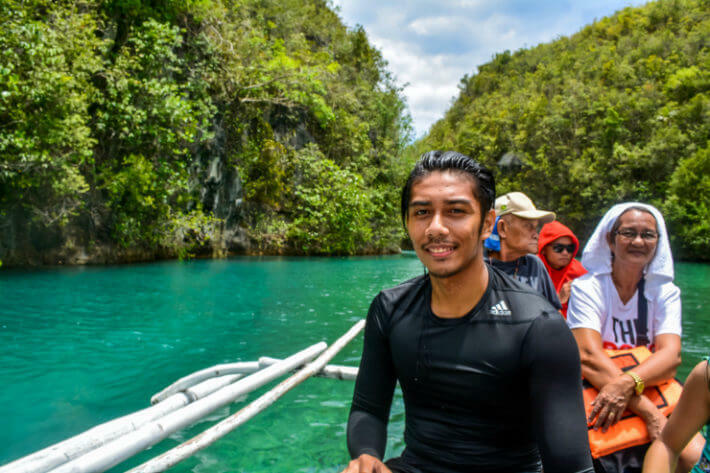 Also, you might want to check out Tickets to Ride since they are offering jeepney tours to Bojo River and Hermit’s Cove. There are a couple of ways to experience the Bojo River cruise – the walk-in option and the package tour. We took the package tour, and I would recommend that you go for this option too. The walk-in tour is cheaper, with an affordable fee of 400 PHP per person. But on the low side, this option only includes the river cruise along Bojo. The package tour, on the other hand, includes the morning snacks, farm tour, river tour, lunch and a whole lot of other stuff, giving you a much more pleasant experience. An important note: Tours must be booked at least two days in advance, with a down payment of 250 per person. One of the things that I really like about the Bojo River Cruise is its purpose. 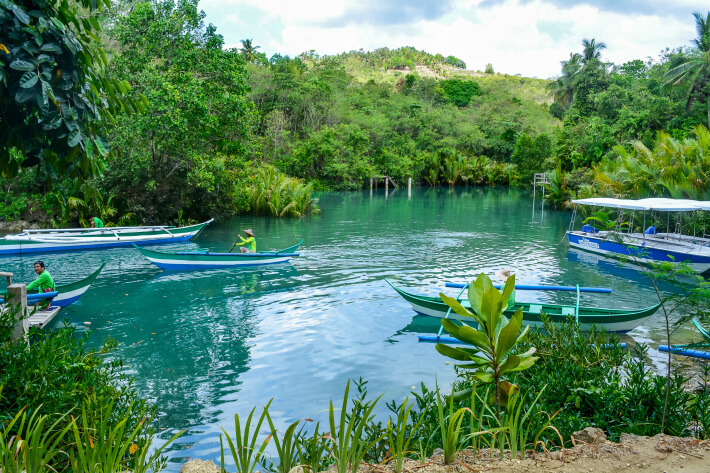 Unlike other tourist spots and attractions, the money you pay for the tour will be used to preserve the environment as well as to give a source of income to the locals in the area. Got a question? Feel free to reach out to me through my Facebook page!